TruAudio Select Series S63 speakers emulate immersive audio experience in home theater demo at CEDIA Expo 2018. 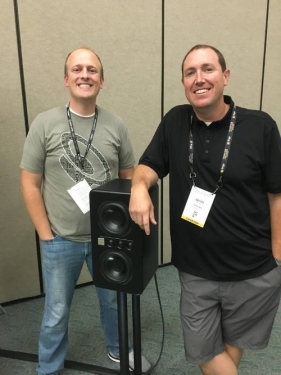 Chase Harrison (left), vice president of sales, and Bryan Garner, president of TruAudio used the company's Select Series S63 speakers and its triple-tweeter, off-center design to conduct a home theater and 2-channel demos at CEDIA Expo 2018. If magicians fool the eyes, then TruAudio has earned the label as magicians for the ears. The St. George, Utah-based company proved at CEDIA Expo 2018 that the ears can be fooled too in its impressive demo the simulated full immersive surround sound. Indeed, I would have sworn on a stack of Bibles during the demo it was immersive Dolby Atmos, but it wasn’t. That is the power of the TruAudio Select Series S63 speakers. Upstairs at CEDIA Expo 2018, TruAudio converted one of the spacious high-performance audio rooms in a demo theater, replete with its Select Series S63 bookshelf speakers featuring an off-center, triple-tweeter design, and a W12 subwoofer. In one particular scene from “Bourne Identity”, Matt Damon is chasing a bad guy through the woods. He shoots off his weapon to scare a flock of birds. The S63 speakers “fooled” my ears (and every integrator in the room) as the high-pitched flutter their wings in unison moved over our heads. Later, Harrison switched to a 2-channel demo using the S63s, with some bass-heavy reggae from King Fisher, and some high-pitched instrumentals from the trio Nickel Creek. Both stereo demos were impressive. The S63 is a multi-driver, two-way sealed box design that utilizes a pair of 6.5-inch high-excursion midrange drivers and a trio of 1-inch tweeters set in a triple array. The drivers feature STEP Technologies’ MMAG motor technology, and the speaker also provides a dual set of binding posts for bi-wire configurations. TruAudio rates the S63’s impedance at 8 ohms, its sensitivity at 87dB, and its continuous SPL at 111dB with 300 watts RMS at one meter. The W12 employs dual 12-inch axially aligned 12-inch woofers, along with an ICE Power Class D internal amplifier that produces 700 watts of power. The company states the sub’s F3 rating is at 22Hz (-3dB), and it has a maximum continuous SPL rating of 115dB.